The generous interior courtyard of Blocks 3 and 4 maximizes this quarter’s exterior open space. A private amenity for residents, it opens towards the south to engage the pedestrian route from the Luas Station. Conceived to maximize daylight into apartments, it captures early morning and late afternoon light. 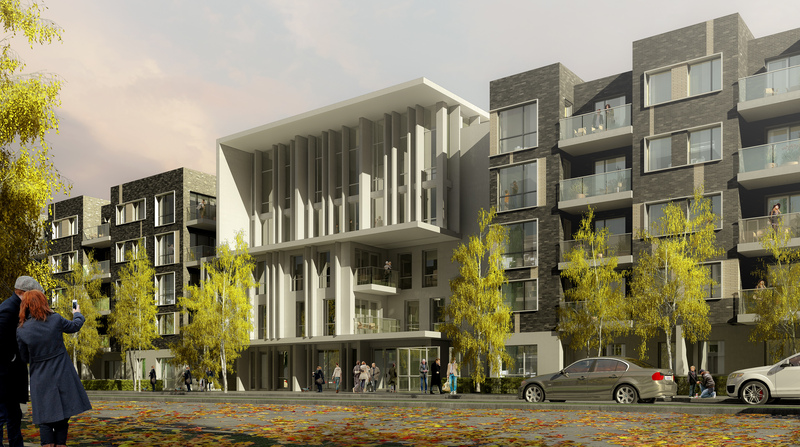 These two residential blocks will contain a mix of unit sizes from studio through to 3-bed. These buildings feature a powerful juxtaposition of materials creating an energy in the project. One has stylishly forward-looking horizontal aluminium bands, with floor to ceiling windows and inset balconies. A series of canopies provide covered walkways. Open plan living ranges from 40 msq. for the studios to 93 msq. for 3 bedroom units. Over half have dual exposure. An office building is planned to the north of this district, with a student block at the opposite end. These will be linked by a tree-lined, low speed road that will also provide access to the site main parking garage under Blocks 1 and 2. An opening at the north of Block 3 links it seamlessly to the park. Street edges conform to an urban grid, while the interior offers surprises with its irregular spaces and unexpected angles. Centred on the western side is the residents’ entry lobby with access to shared amenities on the upper floor. Each of the four resident ‘Houses’ will have a distinct threshold and identity, perhaps expressed by varying colour and material themes. This is unified urban living at its most civilised.